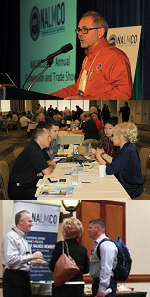 NALMCO offers two of the industry’s top events each year, the Annual Convention and Trade Show and Spring Seminar. Each is designed to equip members to succeed in today’s fast-changing environment. From industry experts who will help you improve your business skills and lighting knowledge. In small group meetings with Associate Members to discuss the latest lighting industry issues and solutions. With members and colleagues to discuss best business practices and stay up to date on the latest industry trends. NALMCO events are never your average lighting conference.